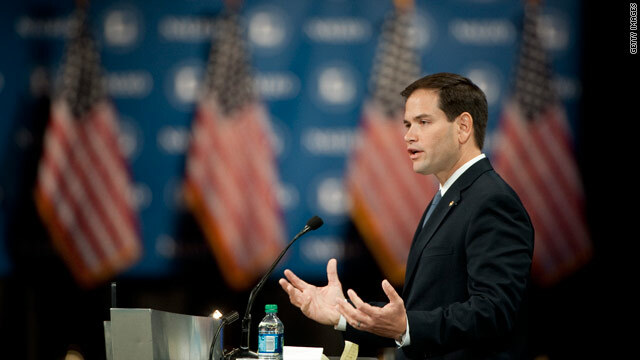 Washington (CNN) – Florida Sen. Marco Rubio attempted to walk the line between science and faith-based creationism in remarks that that have provoked the ire of liberal blogs, leaving the door open to creationism in responding to a recent question about the age of the Earth. Most scientists agree that the Earth is 4.5 billion years old and the universe is 14.5 billion years old. Christian Young Earth Creationists, on the other hand, argue that the weeklong account of God creating the Earth and everything in it represents six 24-hour periods (plus one day of rest) and date the age of the Earth between 6,000 and 10,000 years. His response to GQ’s age of the Earth query has also provoked questions about his political aspirations. Dave Weigel of Slate writes, “How can you read that and not think ‘Iowa’? ” The state is the first to hold a presidential caucus in 2016. Forty-six percent of Americans believe that God created humans in their present form at one point within the past 10,000 years, according to a survey released by Gallup in June. That number has remained unchanged for the past 30 years, since 1982, when Gallup first asked the question on creationism versus evolution. The second most common view is that humans evolved with God's guidance - a view held by 32% of respondents. The view that humans evolved with no guidance from God was held by 15% of respondents. The Gallup poll has not specifically asked about views on the age of the Earth. He was born Catholic, but his family converted to Mormonism when Rubio was 8 years old, according to Rubio’s recent memoir. The family left its LDS faith behind when it moved from Nevada back to Florida and Rubio was confirmed in the Catholic Church. Catholic teaching is that science and faith are not at odds with one another and it is possible to believe what scientists say about the Earth’s age and in God. But many evangelical churches, including Baptist ones, promote a version of creationism. When CNN reached out to Rubio’s Baptist church in Florida on Monday, a person answering the phone would not comment on its teachings about the Earth’s age and said that a church representative was unlikely to be available in the near term. For the past 30 years, the “equal-time argument” –- the idea that Creationism taught alongside evolution -– has been popular method for Creationists to advance their cause. In the late 1980s, some state legislatures passed bills that promoted the idea of a balanced treatment of both ideas in the classroom. In 1987, the issue made it all the way to the Supreme Court, where a Louisiana "equal-time law" was struck down. The court ruled that teaching creationism in public school classrooms was a violation of the Establishment Cause in the Constitution, which is commonly referred to as the separation of church and state. See for yourself below.................The fairy in the sky did NOT create us !!! Monkey Math: Baboons Show Brain's Ability to Understand Numbers ..........E = mc2..............(U-Pb) numbers do not lie ! OR.........take a ride on a DINO. Fossil records are better to read than the nasty bible..................no god(s) required ! For all creationists and ID believers...............IT only takes minutes to figure IT out. No fairy in the sky needed ! May 6, 2013 — Take a swab of saliva from your mouth and within minutes your DNA could be ready for analysis and genome sequencing with the help of a new device. The question can also be turned around to evolutionists- so you believe that humans evolved from rocks to dirt to microbes to, at some point, humans? Which is harder to believe, that there was a creator or that it's all evolution? Which is more controversial? I don't think the Bible gives us answers to the question of how old our planet is, but it does to how it came to be. The problem for evolutionists is- it you turn off and part of evolution you begin the search for a creator and science can't deal with that either. Something higher than man? Well, aliens, yes, but not a 'god'. Nietodarwin, you have 99% of chips' brain, that's almost primate.